Youku.com is a Chinese website which is hard to understand. But don’t despair any longer, I will tell you how to visit the Youku-page in English. the Youku english version could be found here! 1. Go to translate.google.com . 3. Type down www.youku.com to translate that. Press enter to translate. 4. Follow the link of the result. 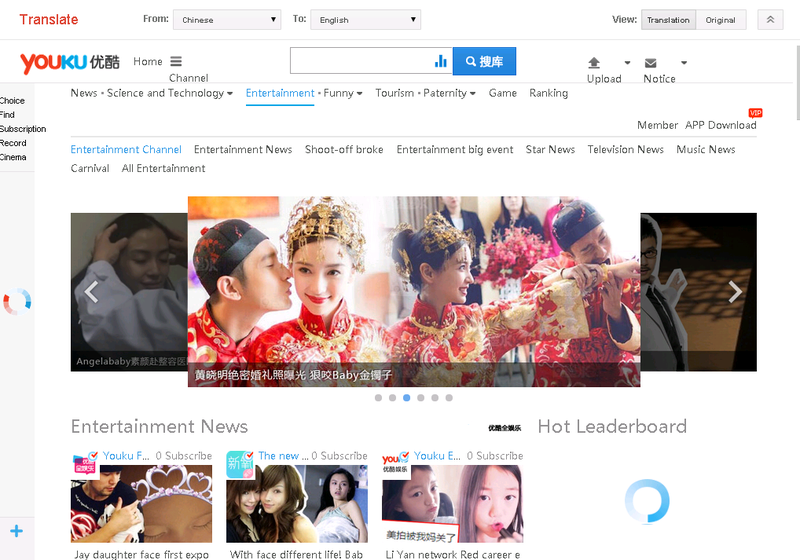 You will be redirected to the original Youku.com website, but translated by Google Translate services. In this page you could browse the website through Google Translate service. Convenient, isn’t it? You will be able to tell which genres you could select and what the translation is of the videos. All the Chinese text has been translated from Chinese to English. This might look a bit crappy interface-wise but it it was it is. Off course you could translate the website to other languages but the main idea still remains. You need to browse through the website using Google translate. In that way languages other than English are possible: Spanish, German, French, Japanese, Polish, whatever. Another good thing is Google translate services stays along with you while browsing the Youku page. So you don’t need to keep going back to the translation page of Google. So easy navigating through the website! So it’s super easy! The Chinese videos are good to watch. Have fun! How to create an account on Youku. How to upload videos on Youku. How to visit sites of Tudou in English. How to visit Baidu.com in English.